Doggy in Wonderland\'s comfy dog beds will have your doggy in doggy dreamland! Snoozing in our beds for dogs is easy and you may be tempted to curl up with them. Dog beds offer your pooch a comfy place to snooze that is all their own and since he or she spends on average about 13 hours a day sleeping, Doggy in Wonderland thinks it should be on a really comfy dog bed! Our dog beds come in a wide variety of styles, colors and sizes making it easy for you to find the absolute perfect dog bed for your favorite doggy. Is your pooch getting a little older and need an orthopedic dog bed? Our beds for dogs collection offers several orthopedic dog bed options. All you need to do is decide whether your doggy would prefer a bolster orthopedic dog bed, a memory foam sleeper or a futon frame orthopedic pet bed. Doggy In Wonderland believes in protecting our environment and we love our organic and eco-friendly dog beds. 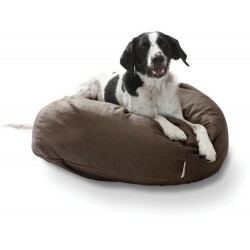 Check out the wonderful selection of comfy eco-friendly dog beds that we have to offer. You\'ll love our selection of comfy beds for dogs - there is a style dog bed that is perfect for your dog\'s comfort just waiting for you. Soft & luxurious! This 3-way bed can convert into a small nest bed, a sac, or can be ope.. This soft minky faux fur cushion is a simple yet comfortable way to give your dog a nice place to re.. These highly versatile Waterproof Indoor/Ourdoor Pet Cushions can be used as a soft indoor wate..